What are you getting Fit4? Would you like to run a marathon, finish the City to Bay, get in shape for your wedding, increase your productivity at work, compete with the elite or simply improve your health to make the most out of life? Fit4’s Director, Scott Cameron established Fit4 as everybody has a reason for improving their health. Scott has been in the fitness industry long before it became trendy and comes with a wealth of knowledge and experience. With over 15 years experience in training individuals of all walks of life and professional sporting teams Scott can help you to develop lifestyle habits that will help you to be your best. Scott is highly credentialed in Adelaide through his Personal Training and Education of other Health Professionals in South Australia, which was recognised by Recreation SA and Fitness Australia through being awarded SA Personal Trainer of the Year 2006 and SA Fitness Professional of the Year 2007. 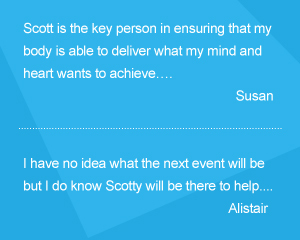 Whether you are looking for one-on-one training, group outdoor training, a lunch time corporate fitness challenge, an employee wellbeing program or a full sporting pre-season program find out why people love training with Scott. Everyone has their own goals and dreams but only a few people take the time and energy to make it happen. Give Scott a call on 0412 144 161 to start getting Fit4 life today.